For a long time, my conquest for the best pillow has led me to try out a bunch of pillows. From latex to memory and what not, I have gone through everyone of them to see if they are really worth the claims made. After losing a good amount of time, patience and dollars, I have concluded that there’s not enough honesty out there. 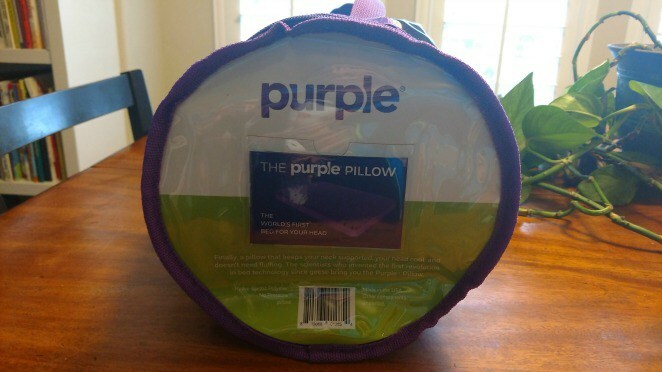 Therefore, Taking the first step towards honesty, I decided to review the latest buzz in the pillow world- the purple pillow. No i am not talking about a purple-colored pillow, but i am talking about the one that the purple mattress company launched. Since the mattress has had some fairly good comments attached to its name, it was time to bring the purple pillow to the test. 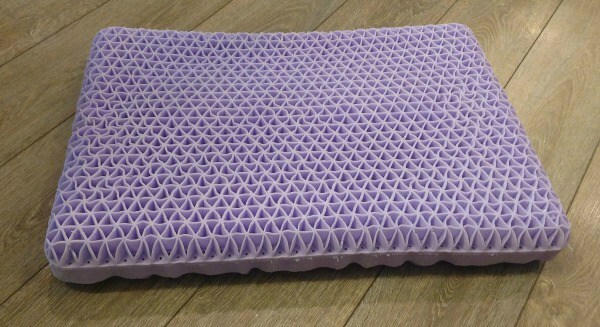 The purple pillow is made out of hyper- Elastic polymer, which will be discussed further in great detail and is known for its no filling concept. The pillow is said to be super firm, supportive and uses smart-grid technology to act almost like a mini-mattress for your head, neck and shoulders. While we all know how bad sleeping postures can bring us down physically, it must be noted that over 80% of the times these bad postures are a direct result of worn out pillows. Traditionally pillows have a construction where the edges are sleek and thin while the filling goes in the middle. The filling plays another important role in determining how good and comfortably will one sleep. If you feel pillows don’t play any role in your life, there are several studies done on how different pillows produce cervical stiffness, headaches and arm aches. The purple pillow is a bed for your head that is firm on the edges and offers comfort from the middle. The Hypo-elastic Polymer is laid out evenly so that all of the cushion stays the same height and fluff. The edges give your neck and shoulders the much needed cradled-support, all while being extremely soft yet firm. So in case you tend to wake up with stiff shoulders and random neck strains, it’s probably time you switch to Purple pillow. First comes the polyester cover which is and super soft. The cover is light-weighted and breathable. Using a zipper, you can easily take out the main purple pillow body conveniently. Plus, the cover is washable which gives it a 100% on the hygiene test too. Upon removing the cover you will see an even, thick pillow made out of hypo-elastic polymer purple which looks like a mesh of little triangles. The innovative pillow weighs 10 pounds but super soft to touch. In fact, if you try to grab the pillow you will notice how it would wiggle and feel like a water bag more than a pillow. Since the pillow isn’t fluffy but soft, another piece comes with this pillow and its the air-booster. If you are not a fan of thin pillows, Purple has got your back. By inflating it, you can add in the extra fluff factor. The air booster goes underneath the pillow to give the whole set some extra height and all of this gets enclosed in the cover. However, if you are happy with the initial height, you will not really make much use of it. Its about to get honest in here. My purple pillow review is as real as it could get. From the time of un-boxing to putting it on my bed, the one thing I noticed was that this pillow was HEAVY. You definitely get the “bed for head” feel with this one. Setting this pillow required minimal work, but a quick glance through the instructions gave me a better idea of what was ahead of me. Warning: One thing which has always been mentioned again and again is that these pillows are not made for pillow fighting. So for the first time I laid my head on the pillow it felt weird because I felt as if my head was on feathers while my shoulder and neck were having proper support. The first night into this pillow, I could not sleep at all. Largely because I have always slept on cushions that tend to be thicker in the middle and having deflating edges. It took me sometime to adjust to it but I can never deny this one thing- Ever since i brought this in my bedroom, my cervical issue and neck strains have gotten so much better. I always believed that a good, firm mattress was far much more important than a pillow and this is where i was wrong. If you have the right kind of pillow that supports your head and neck, you can even sleep on the floor with ease. Imagine a giant blob of firm jelly in front of you- this is what the purple pillow feels like. While for some this might seem disturbing, its actually quite enjoyable since it is super super soft. Being 10 pounds in weight yet being soft like sand is amazing in itself. All thanks to the intelligent Hypo-Elastic Polymer here. So as you rest your head on this pillow, you will instantly feel relaxed as your head sinks in, all while your neck is firmly supported (all thanks to the smart-grid technology there). As compared to any other pillow, you feel that the pressure relief, that comes with this pillow, is STRONG!. The thing with elastic polymer is that most people believe its suffocating. Although nobody can deny its firm density but its the same thickness that can cause air and heat to trap in rather easily. But the purple pillow is designed in such a way that it lets maximum air to pass through it easily, all while retaining the firmness there (the mesh of triangles remember?). Oh and while we are discussing this, did i mention that this pillow is anti-microbial? Yes, it is a piece of heaven for those who tend to suffer from breathing problems and it will combat your breathing allergies as well. The most annoying prospect that comes along with soft pillows is that they trap in much of the body heat. But with the purple pillow, you will always have a cooler side to sleep on. You can sleep easily in one position and won’t feel the cushion heat up all night. And in those winter nights, expect it to do the complete opposite and provide you with a neutrally toasty, snugly side to sleep on. This pillow has a standard size of 24 x 16 x 3 inches, which is good enough to give you proper spinal alignment as you sleep. However, if you are a side sleeper or someone who likes a fluffier pillow, then you can always add in the air-booster and adjust the size according to your choice. One great thing about this pillow is its trail and warranty system. Apparently, there is 100-night trail that comes along with every purple pillow. This means that if you don’t like it, you can simply return it and call in for a refund. In addition to this and unlike other pillows, you can expect this purple pillow to last 10 years. The purple manufacturers know how to pamper their customers. So, in case you want to get your hands on the purple pillow, all you need to is place the order and have it delivered to you, free of cost. Convenience at its best! But not everybody has the same taste. Even though the features are put out, I am sure a few of you don’t find it interesting at all while a few of you are already placing your order on OnPurple.com. But to this, I would suggest to wait and weigh in the benefits and concerns before making any sort of judgement first. You won’t ever have to worry about waking up with an odd neck ache or pulled muscle. You will get the most comforting sleep of your life. You will never wake up sweaty or toasty. NEVER. It is naturally anti-microbial in nature and HYPOALLERGENIC. (means you won’t ever catch an allergy from sleeping on it). In case if the pillow smells funky, you can wash out everything. The cover, filling and even the booster all are washable. Since the warranty time is huge, you will actually save on a lot of money. Normal cushions call in for a replacement every now and the, but with this you can actually get a free of cost replacement as well. Be prepared for the initial smell. Although it is minimal, but you will smell the typical plastic-y smell. Over time it will go away. The firm edges don’t suit most of us, especially the back sleepers. Ideal for people who sleep straight but will cause problems for those who tend to sleep either on the edge of the pillow or sleep on their stomachs. The weight might be too much for some. Though it is breathable and everything but most people don’t like a heavy pillow on their beds. You will notice some white dust kind of particles in the cover, if you try to fluff or slam the pillow here and there. It is the polymer plastic that tends to wear off with blunt force. Don’t worry about the dust. It isn’t harmful either. The air-booster might add in the extra layer of fluff but it will slip away from under the pillow. Therefore, at the end you will get frustrated and take it out. Does it Smell too Bad? Not really. But it does have an initial smell that vanishes in a couple of weeks. If it gets unbearable, wash your pillow well and let it dry. I am sure the comfort it offers far exceeds the initial odor that you might have to bear in the first few weeks. Is it Good for me? Actually anyone who has a head, or has witnessed the aftermath of the cruelty done on our necks as we sleep, needs this. The idea behind purple pillow was to treat the neck, head, shoulder region with some respect and bring in a pillow that would cater each individual section without being over-whelming. The size, softness and firmness level all do justice to one. As compared to other pillows, there is a remarkable difference in almost everything- the smart-grid technology is far much more beneficial, the air-booster gives everyone better control on the height and fluff and lastly, it is a crowd-peaser and hypo-allergenic. While all these characteristics make it stand out, there are a few loopholes which are not exactly violating any special rules of sleeping, but tend to challenge them. Since this pillow actually introduces us to the right way of sleeping, and we are habitual of sleeping in the most bizarre, unhealthy ways, I am pretty sure that the purple pillow is a part of a healthier lifestyle. On my 5 star rate-scale, the purple pillow gets a cozy 4 out of 5 stars for sure. While it seems stiff and different, it is definitely an excellent choice for those who suffer physical issues due to bad sleeping habits. Have you used one yet? Let me know your reviews on Purple pillow in the comments section below.